This time around we take a quick trip into the aquarium to see the penguins, sharks, and jellyfish. First up is the penguin display. This place is amazing, and the penguins never fail to impress. The zoo has built a climate controlled environment with contoured surface and "hills" for them to climb, snow falling all day long, and a pool for swimming, all while having a great view of the crazy humans that come to entertain them all day long. The humans stack up on several tiers so the penguins can see them better, and there is even a rail not far from the glass to allow the human children room to come up closer without the adults getting in the way. The glass is floor to ceiling and even during a leisurely swim they can see the humans on display. The keepers have even installed microphone in the enclosure to allow the penguins to serenade the humans with their lovely voices. The humans seem to enjoy hearing the conversations while being watched by the penguins. There is also a live webcam for you to control and watch the penguins any time you wish. You can see the webcam hanging from the ceiling in the picture above. After leaving the penguin display you go through displays of various fish and plants found in the oceans. Yes, the clownfish are there and the children as all yelling that they found Nemo. One section that I found particularly interesting is the smulated tidal pool. This displa is all about what you might see in a south pacific beach, but from a side view, including regular wave action. 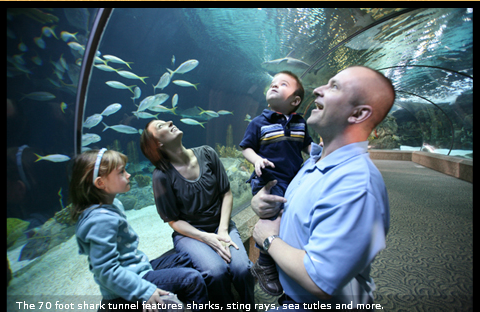 From there you move through a 7 foot high tunnel that is runs through the 900,000 gallon salt water aquarium featuring sharks, turtles, and other ocean dwelling creatures. The grace of a turtle floating through the water without effort relaxes you and brings a moment of serenity. The greatest moment is when you are standing in the tunnel and a fierce tiger shark swims directly over your head with his jaws open, teeth gleeming in the light. You can easily imagine that he has only spared you from becoming his dinner because you are not worthy of his time and effort. Leaving the tunnel you now face more displays including the incredible display of jellyfish. floating in a clear column of water, lit by black lights (who knew they weren't just for posters?) the jellyfish seem so fragile and angelic. Just in front of the jellyfish you find another column, this one has a large school of Round Pompano whose silvery scales gleam in the white lights shining down into the column tank. This concludes the tour through the Scott Aquarium, but not the tour of the Omaha Henry Doorly Zoo. Look for more in upcoming posts in the near future on this great place to visit in Omaha.